PORTLAND, OR. — Walking into Mrs Teapot’s Tiny Tots preschool, located in a 1950s-era bungalow in the Kenton neighborhood, is a very different experience now than it was before the home’s indoor air quality was tested and improved. It all began in January 2016, when AirAdvice For Homes, a local company specializing in indoor air testing and analysis, found higher-than-normal levels of particulate matter, chemical pollutants, carbon dioxide, and humidity at the school. Tiny Tots hadn’t been doing anything wrong and couldn’t have known about the issues without bringing in experts with specialized monitoring equipment. And after the test, AirAdvice noted that it is common to see the same kinds of air contaminant levels in most homes. However, the results raised the preschool’s concern about health issues. Less-than-ideal air quality can trigger asthma attacks and allergy symptoms, support growth of mold and dust mites, diminish cognitive function, and simply make an indoor environment less comfortable to live and work in. That’s when Neil Kelly’s Home Performance team, partnering with Honeywell, installed equipment to clean and circulate the air more efficiently at the preschool. This included a new thermostat, ventilator, air filtration cabinet and UV air purifier. 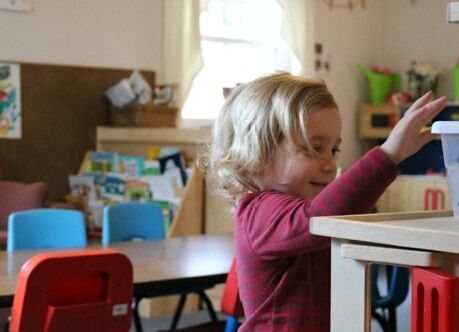 A later indoor air quality test, also conducted by AirAdvice, showed that the retrofits were able to lower air contaminants at the preschool to acceptable levels, and improve overall air flow throughout the space. Teri Fisher, owner of Mrs. Teapot’s Tiny Tots, celebrated the work that was done by the contractors and underscored the project’s impact on children’s health. Chad Ruhoff, Neil Kelly’s Home Improvement VP, emphasized the company’s commitment to community. Read AirAdvice For Homes’ case study to learn about the air testing that was done and the systems that were installed at the preschool. Neil Kelly also provides indoor air quality testing for homes. If someone in your household is suffering from asthma or other respiratory issues that could be related to indoor air quality, contact Neil Kelly for an assessment.